The way in which we use pronouns such as I, you, or him - or choose not to use them - reveals quite a bit about our personalities but not necessarily in the ways we might think. That’s the premise of a new book, “The Secret Life of Pronouns,’’ by psychologist James Pennebaker, which hits bookstores on Aug. 30 and draws some surprising conclusions. President Obama, on the other hand, uses the pronoun I less than other presidents when speaking off-the-cuff to reporters, which Pennebaker said reflects his self confidence - and his sense of emotional detachment. “Compared to other presidents like Bush and Clinton, he uses active verbs at high rates and pronouns at low rates during his press conferences,’’ said Pennebaker. On the other hand, politicians who preface their ideas with “I think we should. . .’’ often are looking to hedge their bets, leaving open the possibility that what they think could be completely misguided. What about the collective “we’’ that I often catch myself using in my conversations? Through his research, he also found that happy couples tend to mimic each other’s style of pronoun use. Married poets Elizabeth Barrett and Robert Browning had matching writing styles, Pennebaker said, as did Slyvia Plath and her husband Ted Hughes at least until their marriage hit the rocks. AguaCaliente wrote : One thing’s for sure. Any funds I come home with are “our’’ money, while my wife’s income is “hers.’’ You can take that to the bank. 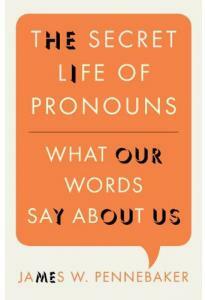 gold279 wrote: Rather than psychoanalyze people’s use of pronouns, I’d like to get more people to use pronouns correctly. chloe2006 wrote: My soon-to-be-ex always used the “blameless’’ passive or the third person pronoun to describe our issues, never using “I’’ for example, “it just gets more distant’’ meaning our marriage. He also always referred to me as “the’’ wife (for me) and “the’’ family (for us and our children), as if we had nothing to do with him. What’s my newborn baby’s weight? Mothers want to know because it’s a detail worth sharing with close friends and family. Doctors want to know because it has always been considered a cause for concern if a baby drops too far below its birth weight. But a new study by researchers at the University of Ottawa School of Nursing suggests that the factors behind a baby’s birth weight are more complicated than we might think. The researchers recorded the amount of oral and IV fluids mothers were receiving while in labor or before a C-section, and had parents weigh their babies every 12 hours in the weeks after delivery. They found that the more fluids moms got in the two hours before delivery, the more weight their baby lost post-partum. shiplore wrote : Thanks for this; our baby’s weight dropped about 12 percent in the 24 hours after birth and the hospital scolded us for not feeding him enough. My wife had been on fluids for over 48 hours [before birth], and this would have been very reassuring to know. While federal health officials say we should aim for 150 minutes a week of moderate activity to reap health benefits, a new study suggests we can get far less - just 15 minutes a day on most days totaling 92 minutes a week - to add a few years to our lives. The finding published online last week in the British journal Lancet may lead some avid exercisers to think they should cut back on those hourlong runs. That, of course, is the wrong approach to take, said Dr. I-Min Lee, an associate epidemiologist at Brigham and Women’s Hospital. She published a study last year showing that American women needed to work out at least 60 minutes a day to maintain their weight over the decades. Lee said the Lancet study - which examined the fitness habits of more than 400,000 Taiwanese residents - adds to the growing body of research that indicates a little activity is better than none but that the more activity you get, the better. The researchers found that women who exercised moderately for as little as 15 minutes a day added three years to their lives while men added about 2.5 years compared to those who didn’t exercise at all. Moderate activity was equivalent to a brisk walk or other steady exercise that would allow you to carry on a conversation but not sing, explained Lee. “A stroll in the mall doesn’t count.’’ D.K. lgmoney wrote : Something is better than nothing. Everyone is different, do what you can, but if you are tied to a desk 8-plus hours a day, [take] at least an hour a day to get [your] heart rate up, and eat well.